Numerous automakers, particularly foreign brands, have managed to maintain their Purchase Consideration levels with consumers in the face of a year-long car-buying slump, according to YouGov BrandIndex. 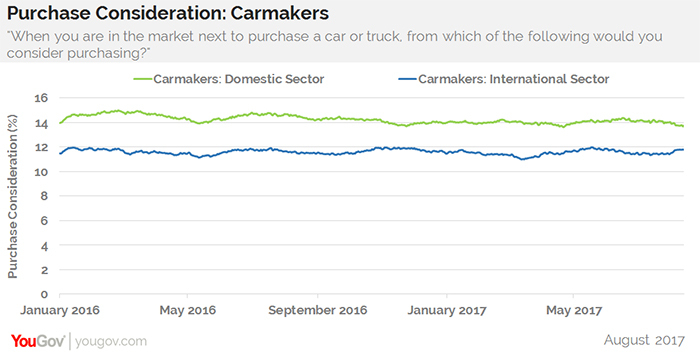 The carmaker sector, both domestic and international, has seen its Purchase Consideration average decrease from 12% to 11%, a significant drop considering the size of the potential market. Purchase Consideration, which asks consumers whether they’d consider buying a certain brand when next in the market for a vehicle, is YouGov BrandIndex’s key metric for measuring potential revenue. The drop has been primarily led by domestic brands — notably Ford, Dodge, and Buick — though one luxury plate (Lexus) and one international maker (Volvo) have also contributed to the overall decline. Ford still holds the second highest Purchase Consideration score in the industry, with 30% of adults 18 and over considering purchasing one the next time they are in the market for a car. Three major domestic carmakers, however, seem to have avoided the Purchase Consideration slump: General Motors (13%), Lincoln (6%), and Chevrolet (27%, third highest in industry) have all remained unchanged. Global brands, meanwhile, have been holding up much better: Toyota on top (32%), followed by Honda (25%), Nissan and Subaru (16%), and Hyundai (14%).